So, I just got back from France. Fantastic trip, went there to race the Duathlon World Championships and represent for Team USA. Great race venue in a little town called Nancy. Anyway, on to the point of this post. So, United makes a heck of an effort to get you to upgrade from Economy to Economy Plus. Why? You get more leg room for one. A huge selling point. BUT, something they do not tell you or show you is.. they steal room from you that you paid for to make room for some huge silver metal box full of electronic equipment. Yep, right in your leg room is a metal box that must be 6-8″ wide that steals the already pitifully small leg room I did pay for and I was not told about it in advance. 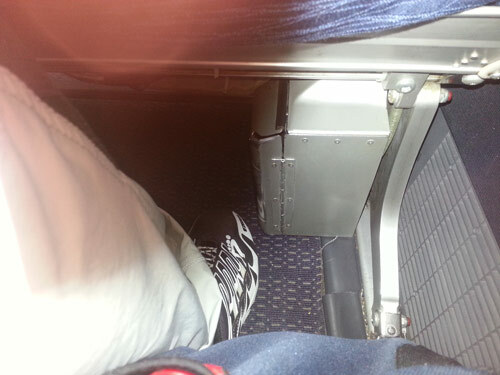 Looking around the plane, these boxes are under every seat I could see. So great, I had an 8+ hour flight (twice) with at least 1/3 of the space reserved for my feet stolen from me so they could make room for their equipment. If You Can’t Workout at the Airport.. Why Not Surf?